I was recently contacted by Oriental Trading Company to see what I could come up with. I have always shopped there for party supplies, but it never even occurred to me to look through the craft supplies! Man, I have been missing out! They have so many different supplies, the ideas in my head were swimming in circles! 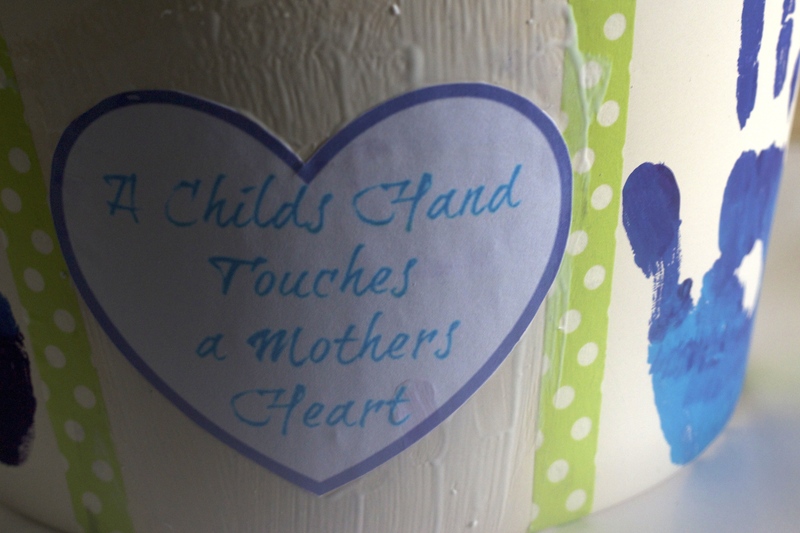 Since Mother’s Day is right around the corner, and it is always amazing to get something hand made from my children, I decided to get crafty with them. I let them decide what they wanted to make, and trying to get a 9 year old and a 4 year old to agree is not easy! 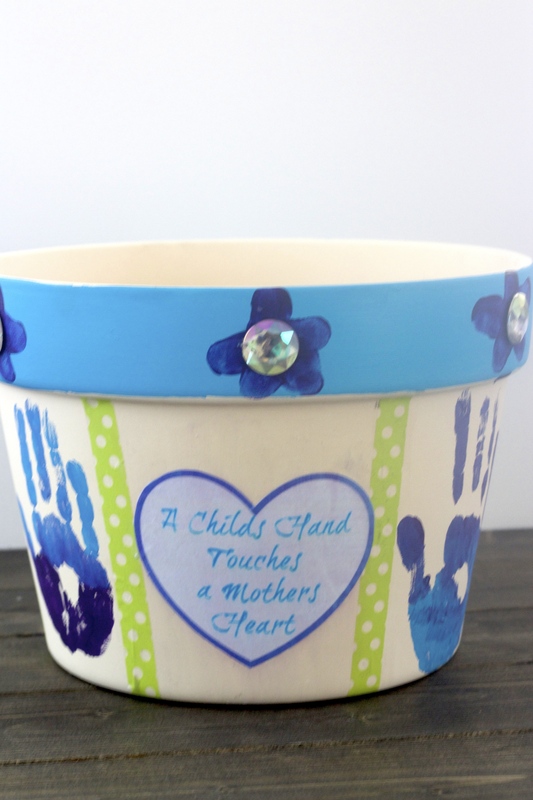 So we compromised on this super easy Mother’s Day gift, a hand print planter. The first thing I did was measure the circumference of the pot, that way I could decide how wide I wanted each section to be. I based my section sizes on my children’s hands, and went with 4 inches apart. 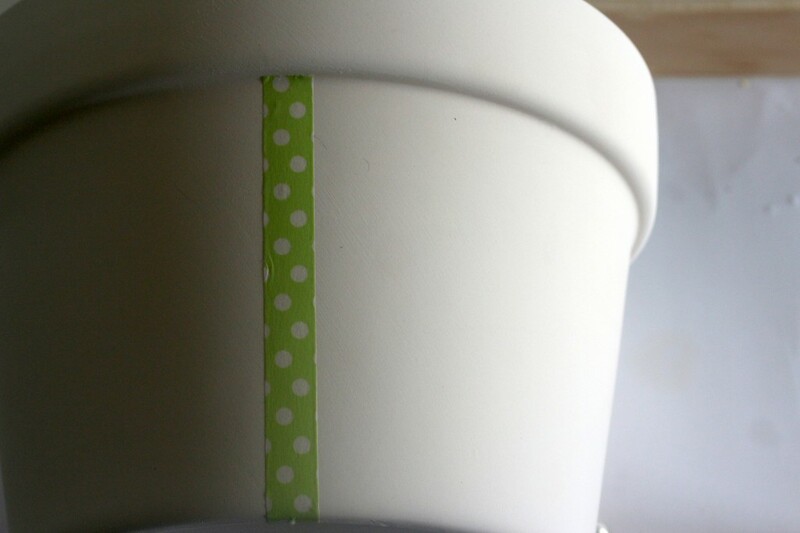 I marked each place I wanted to place a borderline and then carefully places a strip of Washi tape to mark it. After each section was marked, I painted the kids hands in their color choices and placed their handprints in every other section. I wanted to personalize it a bit, but my hand writing is absolutely horrible for crafts, so I simply hopped over to PicMonkey and created a cute heart with a sentimental saying on it. 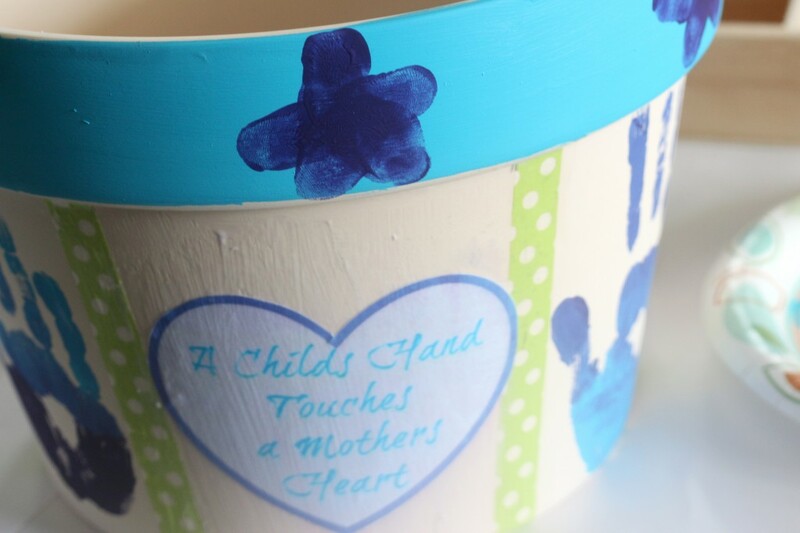 You could also hand paint something sentimental if you rock like that. You could even create a collage of photos to place in the sections as well. But for my kids protection, I opted for cute sayings instead. After the handprints dried, I placed my photos in the empty sections and then covered the entire thing in two layers of Mod Podge to protect everything. 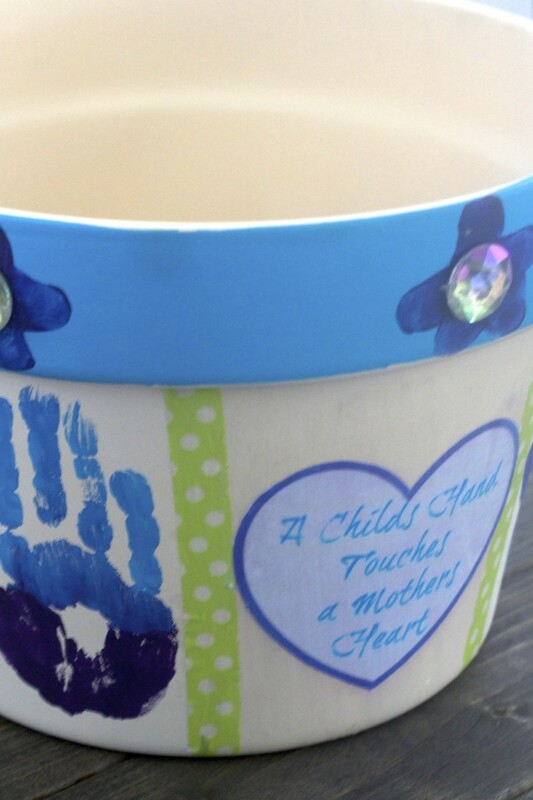 With me, too much is never enough, so I let the kids paint the upper portion of the flower pot. Once that dried, I painted their little thumbs and had them make thumbprint flowers around the top boarder. 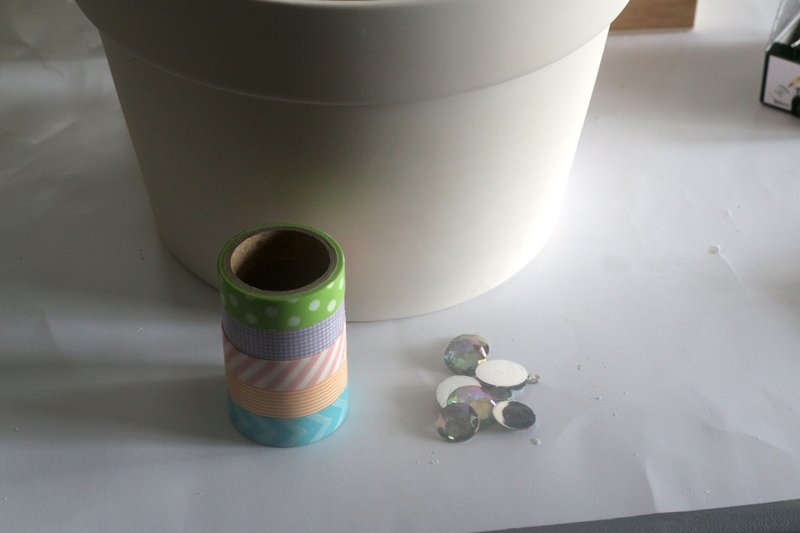 To finish off the flowers, we used a little more Mod Podge to adhere some cute iridescent Jewels to the center of each flower to give it some bling. What are you doing for Mother’s Day? Do you make your own gifts to give? Or do you buy them? I was supplied with materials from Oriental Trading company for this project. All ideas and opinions are 100% my own. Previous Post: « Peanut Butter Pie Recipe!